Handmade crochet accessories always look so elegant. Bring the Caribbean into your winter months with this infinity scarf which is a rainbow of colors with shades of blues and green. This open-worked scarf can make your look romantic and affectionate. The item features an attractive design pattern accompanied with a mesh open weave section. You can wear this accessory as a scarf down loose or doubled up for warmth. A daytime accessory, practical for keeping your neck warm or romantic when worn in the evening. 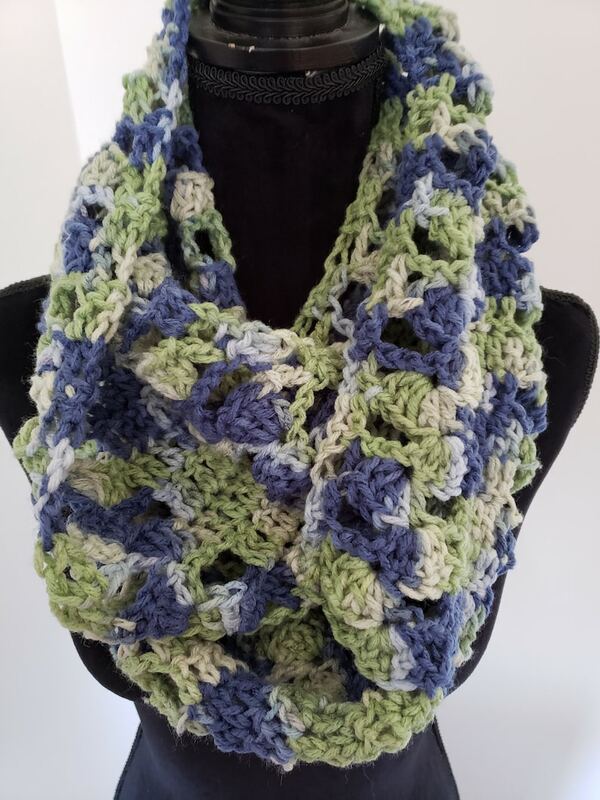 I used an ultra soft acrylic yarn to hand crochet this intricate infinity scarf for you. This scarf is One Of A Kind! Nice weight yarn to keep you warm and stylish. If you`re looking for something 100% classical - draw your attention to this item...it will definitely draw attention to you!! Care: This scarf can be machine washed and dried. Scarf measures 64" in circumference and 7.5" in width.